What Is In Demand Right Now? With the uncertainty of investing in the share market we have seen a heavy transition of investors who have traditionally not owned commercial property jumping right in and acquiring key assets in various commercial sectors. The see it, touch it, feel it analogy with investing has assisted in the confidence shown by some existing commercial investors and also new investors in recent times with yields reflecting investors long term strategies for set and forget style properties. We are seeing most types of investments that have a 3 year lease or longer securing strong interest from various types of investors and reflecting yields from as low as 6.5% to 8.5%. The longer the lease, the better the tenant; the greater the security in place, the better the yield on the sale. Should you have a commercial property in your portfolio at present with a lease in place it is a great time to be reassessing your strategy and also understanding the value of your property for the purposes of resale or valuation to assist in potentially allowing greater leverage to acquire more property in the current market. Properties that are vacant at the moment may be able to be purchased at below market rates and with a small investment into the property to assist in securing a tenant then be turned around for re-sale or held in the portfolio for long term investment. Any questions on how to grow your portfolio by leveraging from current market values of capitalizing on strong sales yields give the team at NAI Harcourts Pinnacle a call. It’s no surprise that in this digital age the most cost effective way to market your commercial property for sale or lease is via the internet. We are finding it ever more impossible to turn ourselves off from being ‘online’ or ‘connected’ to the world, be it through social media, text, or emails. It’s also no surprise that 90% of all enquiries for commercial property come from online websites. It’s a massive advantage to have an online listing when you are looking to sell or lease. However, something I have noticed recently is effecting your ability to get a result. There is no need to panic thou because there is a simple solution. Firstly, let me tell you what this major problem is. I’ve noticed recently particular agencies uploading multiple online advertisements for a single property, for example, a large portion of land with a large open warehouse is being advertised multiple times through the same agency but with different size specifications. Take a property which has a 400m2 Warehouse with 1,000m2 of Hardstand. What we have been seeing is ads with various size amounts for lease resulting in multiple ads for what essentially is the same property. So there may be an ad for 200m2 of Warehouse and 400m2 of hardstand, then, that same location is advertised as 400m2 Warehouse with 400m2 Hardstand from the same agent. Individually each advertisement is possible. These are basic free online listings and cost the agent zero dollars. But here lies the problem. With this occurring, it effectively pushes your advert down the order, and when agents are uploading 5 of these ads for the same property in a matter of minutes it is quick for your ad to fall off the radar all together. Recently I noticed one particular agency holding the first 64 free online listings on a popular commercial real estate website for one particular suburb, many ads were multiple ads for the same property or ads of properties no longer available. The same practice is occurring for Warehouse Unit Complexes and Office Complexes, multiple ads for the same property or even listing ads for units not authorised by the owner. The reason is simple, the agent wants attention, and they want to look like they are dominating the area. This is effecting your ability to achieve a result. 64 basic listings means if you have a basic listing prior to this mass uploading then your ad isn't visible until page 7 of a prospected buyer/tenants search. So here lies the solution. It’s simple, it’s very effective and prevents this multiple listing by agents degrading the market and your property. You need to upgrade your listing online. Upgraded listings are crucial and may be done for as little as $495. With an upgraded listing online, your property will always stay above these free multiple listings of other agents and keep your property at the forefront of the market. Reports from website real commercial show that an upgraded listing also creates more enquiry on average. We recommend all our clients upgrade their listings online. It’s a proven method and cost-effective, and will keep your property at the top. Contact us for more information or advice. Too often of late we have been encountering property owners who unfortunately haven't been fully informed of certain aspects in the new Form 6 used in the sale/lease process of their property. To quickly explain, the Form 6 is the legally binding document required to appoint and/or reappoint a property agent, resident letting agent or property auctioneer to provide services outlined in the form; mainly the sale, lease and/or management of property. On a number of occasions we have found the issue lies in the appointed property agent failing to inform the property owner exactly what each section of the form means to the owner. Commonly, this seems to occur when the agent is pursuing a favorable outcome for themselves and whilst the information is provided, the agent might deliberately choose not to explain some aspects of the paperwork so as to not draw attention to their motives. Unfortunately we have seen cases where owners have signed Exclusive Agency periods, whilst being unaware of the difference between Exclusive and Open Agency. Another common occurrence of late is owners signing Exclusive Agency periods for up to 12 months without being informed of the reasoning behind this and how this effects the marketing of their number one asset. Whilst these may sound like little things, it can become quite costly if your property is ineffectively handled for even a short period of time; that ‘one’ perfect buyer/tenant may just walk on by. Don’t be afraid to question parts of the form with your Agent. There is no reason why they should not be able to completely explain to you exactly what you are agreeing to. If doubt still exist, don’t hesitate to seek independent legal advice before signing the form, in addition, more information may be found by visiting the Office of Fair Trading website. At NAI Harcourts Pinnacle, we ensure that we go through the Form 6 in its entirety with you, no matter how many Form 6’s you’ve signed in the past, it’s our duty to you as our client that you are completely aware of your rights and obligations under the Form and of the services you are entitled to receive from us as your agent. Before any agent ask you to "just sign here"; make sure they ask you if you have any questions and you feel comfortable first. This is a great sign the agent is acting in your best interest. Buying a Property For Your Business? What's Your End Game? So, you're looking around to buy a property for your business, in your mind you know exactly what you want, exactly what you need and all of your focus is on finding that exact property The most common thing people forget to do when purchasing commercial property is to have a good understanding of what happens if and when they need to sell or lease the property. At some point in time you won’t need that premises for whatever reason, your business shuts down, you need to expand or maybe you need to downsize. When purchasing a property, whilst the main focus is to ensure it works productively for your business, there needs to be a small token of emphasis placed on that property also being suitable for the next person. All too regularly do we as agents walk into properties that have worked extremely well for one type of business, only for that business to vacate and the property sits empty for a long time. It may be because of various reason, there may be too much office space for an industrial shed or copious square metres of storage mezzanines or limited access for large vehicles. Once a business moves out a commercial decision needs to be made and appropriate advice needs to be made from experienced real estate agents in that area as to what is most commonly required in the current market. By educating yourself on the market and what is needed it can reduce time on market and in some instances increase value by providing a building that is desired in the marketplace. Murphy’s law is not a reason to leave things in a property. Owners tell me they will remove a mezzanine if it’s not needed or reduce the amount of office if not required. The reality is in most cases if these things are done in the first place there will be less negative responses from prospective tenants and buyers at inspection time. If a tenant requires more office, more mezzanine or more power and it’s not there either because you removed it after the previous tenant left or not, they will spend the money to install it as long as they can see that the base building layout works. Don’t work on assumptions work on facts. Experienced agents should know what is needed in each type of property. Ask the questions and when it is that time that you don’t need that property anymore get the property positioned correctly ready for sale or lease. It seems like the more private investors I come into contact with the more I struggle to understand how some of them like giving away money so much. You might be wondering 'what is this guy on about?' Well, as an experienced real estate agent specializing in the sale of commercial property I speak with a lot of investors who have owned investment properties for a long time. It is becoming alarmingly obvious that a lot of these investors have failed or have become lazy in what I would consider the first rule of investing to be - to understand what the investment is that you have invested in. If you have owned your investment property for a number of years and the tenants are paying rent on time, all seems to be cruising along nicely, it is very easy to fall into a false sense of comfort with your property. What do I mean? Well, if you have single or multiple tenants in your property and they have been there a long period of time, chances are they are no longer on leases, however, you think it's o.k. because they pay on time and they won't move. You may very well be right, but, if you haven't reviewed your property and it's currently in this type of situation, it's more than likely that you are giving away money! Not literally, but if that tenant is paying below market rent and not on a lease, you are risking losing track of your investment. Not every case can you have market rents paid or full occupancy, so you have to make commercial decisions on renewals and rent increases, however, without a property review on your investment how would you know? As a qualified experienced real estate agent we can assist in this process for you. We reviewed a client's portfolio of 3 properties of which they had 16 tenants across the three. Out of the three properties, all were achieving below market rental rates and only two tenants were on formal leases. We discussed the Pro's and Con's of renegotiating these tenancies progressively over the coming months and through clever and structured lease negotiations we managed to increase their net income by over $100,000 per annum. Now this is just one example of one particular client and you may be thinking that's an extreme case, the reality is this is becoming a common occurrence when analyzing people's investment properties. Maybe not to this scale but every dollar counts. If you sound like one of these owners that hasn't reviewed your property lately I would suggest it to be highly worthwhile to do so. Yov worked hard for your money and it is an investment after all. Is Presentation Important in Industrial Property? Gone are the days when your first thought of industrial property is dirty manufacturing and old steel sheds. With the dramatically changing economy over the last ten years we have seen a continual shift into new concrete tilt panel office/warehouse throughout the traditional industrial sectors. With the changing dynamics in tenant use we are seeing a greater discrepancy between the pricing and time on market of the new and old buildings. Whilst a lot of the buildings that are being leased are price sensitive there is one key factor that a lot of owners forget to attend to.. Presentation. Regardless if the building is new or old, tenants are now placing a lot more emphasis on presentation and appearance of their place of business. If you have a capable experienced real estate agent they should be able to guide you on some of the most cost effective ways to improve your overall buildings performance to assist in minimizing time on market and maximizing rental returns or sale price. Simple things like repainting office walls, replacing old carpet with new, keeping gardens maintained, repaint visible external walls and update old sign pylons with new sign pylons. You are probably reading this thinking I don’t want to spend all this money only for a tenant to ruin it and for repairs to be needed again. Not the case, the best part of commercial real estate is that if you use an experienced real estate agent you can negotiate that prior to vacating, the tenant needs to return the building to the same level of presentation as what they entered the lease in. With this correctly negotiated at the start, your ongoing capital expenditure is lower and the tenants continually maintain your investment for you. So presentation has become extremely important in reducing time on market and improving the $/m2 rates achieved for both lease and sale. Open Listing Your Property In A Tough Market! I'm sure everyone has heard the pros and cons of open listings, but the question is, does it work in a tough market? The idea behind open listing your property is that you give all the agents a chance to sell or lease your property and it opens the property to all of those agents' potential clients. Correct it does, however there are two main things that in a tough market don't help you as an owner when having an open listing. As each of those agents are now competing against the other agents to do the quickest deal their focus is not on achieving the best price but now its all about beating the other agents and then talking the clients into doing a deal. When there is multiple agents a potential buyer ask each agent what the listed price is, whilst they should all be the same, it only takes one agent to say the phrase "I can get you a deal" or "I can get it for less" and that's when you have lost your potential to achieve the highest possible price. I commonly explain the scenario like this. If you were going to buy a Holden Commodore and there was a whole bunch of dealerships selling the same model you wanted. You are going to go from one dealership to the next until you find the dealer who is going to sell you that specific model the cheapest. Well, when you have multiple agents signs up out the front of your property the potential buyer or tenant will ring each one until they find the one who will screw the price down for them the most. The other main reason is that most agents won't go through the ideal sales or leasing strategy including marketing or pricing as they just want the listing to get more enquiries whether that is for your property or the next. There is no control from the vendor nor any requirement for that agent to provide you with ongoing feedback on enquiries, inspections or market changes. In this scenario you might as well stick your own sign up because you're paying an agent to take a phone call. If it's a million dollar property that's a $30,000 phone call. Be smart about the sale of your asset and choose an agent or agents that provide ongoing continual feedback to keep you educated and a guarantee that if they don't then you can terminate the agreement. Accountability is key to a successful sale or lease campaign. This is a phrase I hear a lot! It is usually followed by "I've got great tenants and they have been there for a long time." It is sometimes followed by "I'm leaving it to the kids eventually." These statements ring alarm bells for me. The reason for this is even if you don't want to sell your property now and have no intentions to anytime soon, you DON'T know what will happen in the future. There may be a family tragedy, an illness, an unexpected business expense that may occur that forces you to sell the property you had no intentions of selling. Have I reviewed my investment performance lately? Have I checked what market leasing rates are in my investment suburb? Are my tenants on leases? Have I done maintenance checks on my property? - Is there rusted out gutters? - Does the building need to be repainted? - Is the plant and equipment up to date and working well? - Is the plumbing working efficiently? - Is the fire equipment up to date? These are just some of the questions you need to ask yourself honestly about your investment properties and if you answered no to any of these it is time to speak with an experienced commercial real estate agent so they can assist you in positioning you for the best outcome in the future and now. The month of June has seen NAI Harcourts secure a number of large and medium sized Lease deals for our clients. We are pleased to provide a couple of our clients with fantastic long-term lease deals on their main road properties in the Geebung and Virginia area. We have also secured a number of deals all over Brisbane, from Morningside to Mitchelton. We have seen a slight increase in inquiry into commercial properties and we have also seen first-hand the benefits of vendors upgrading their property advertising campaign online. Online advertising is the number one way to obtain interest and is paramount to securing a suitable deal in the fastest time possible. An upgraded listing will keep your property in quick sight of the market and hopefully provide greater interest. Make sure you take advantage of the half-price offer for online advertising with the realcommercial website currently on offer until the end of June. 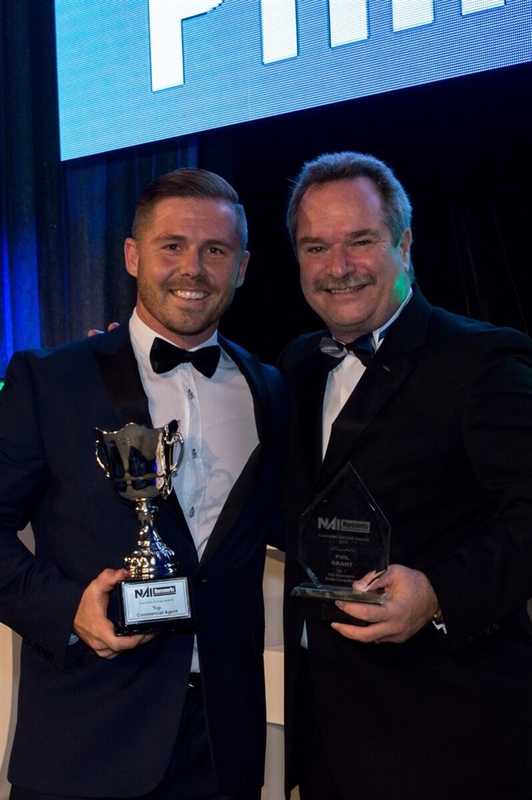 NAI Harcourts Pinnacle Director - Phil Grant (Left) receiving NAI Harcourts Australia Number 1 Sales Consultant award from Harcourts International Managing Director - Mike Green. Last week the annual Harcourts Australia National Conference was held on the Gold Coast. Consisting of key note speakers, industry supplier exhibits and concluding with the Harcourts National Annual Awards. NAI Harcourts professionals have come away with additional motivation to serve our clients even better and to become the premier Commercial Agency in Australia. Congratulations to our very own NAI Harcourts Director, Phil Grant who was acknowledged as the 2015 Number 1 NAI Harcourts Commercial Sales Consultant in Australia. This award is a true reflection of the dedication and expertise that Phil puts into his work every day. Whether it be a Multi-Million dollar property sale or a small lease, Phil gives everything he has to provide his clients with the best results and was duly recognised with this Award. Congratulations Phil Grant from everyone at NAI Harcourts Pinnacle! Last Saturday night Harcourts Queensland hosted their 2014-2015 Annual Awards and we are pleased to announce that our very own Director, Phil Grant was honored as the Number One performing NAI Harcourts Commercial Agent in Queensland for the 2014-15 Financial Year. April 25th 2015 marks the 100th year anniversary of the Gallipoli campaign during World War I. NAI Harcourts wish to take this opportunity to remember all of our nation's brave past and present Service Men & Women. The sacrifices these courageous individuals make for the love of our Country and the freedoms we hold will never be forgotten. Lest We Forget. The goal of advertising is to give your property exposure to as many people 'in the market' as possible. The more people aware of your property the better chance you have at increasing demand and eventually getting the best possible deal completed. Having an advertising plan also reduces the risk of wasting money on ineffective advertising and paying more in ongoing cost should the property not be sold/leased. NAI Harcourts Director, Phil Grant believes the best cost effective methods for commercial property advertising are to have an upgraded property listing on the two main commercial real estate sites – realcommercial.com and commercialrealestate.com and an Agency Advertising signboard located at the property whenever possible. Of course, other advertising avenues may be beneficial depending on the property and target market. REA Group Ltd, the owners of popular websites realestate.com and realcommercial.com show that 86% of potential buyers use online as their main tool when searching for property, making online being a critical starting point for any property marketing. The use of free listings are essential however REA also shows that upgrading your property listing to a Premiere Property Listing can give your property on average up to 20 times more views and 9 times the enquiries than a standard listing. A much over looked product of advertising is the Agent and Agency itself. Is your Agent actively advertising your property through such avenues as email’s to the agency’s database, door knocking in the area of the property, calling prospective buyers? Remember, it’s the agent who is advertising your property, are they doing all they can to market your property to maximise exposure? Another important aspect to remember is how you market your property for inspections, this isn’t as important as a residential property inspection, but ensuring your warehouse or office is free from clutter, and kept tidy does give potential buyers/tenants a better first impression of the property, and also allows them to better visualise the space. This tends to give the potential buyer positive emotional connections to the property, increasing the chance of a deal. Please feel free to give the team a call anytime if you’d like to discuss the importance of effective advertising or if you’d like more information on Commercial Property. We hope you had a good Christmas and New Years, and hopefully got to enjoy a bit of a break over the holiday period. It's hard to believe another year has gone by, it seems they keep getting faster. We're back into it, with plenty of negotiations in play and enquiries coming through. This year will be a year of change for us, starting with a change of staff as Phil's current Personal Assistant part's ways to go on Maternity Leave, with a new Personal Assistant coming on board late January. Shortly after in February/March we are moving premises to a much larger, two story office as we have outgrown our current space. It will be in the Aspley Fountain complex, directly across the road from where we are now. Once the move is completed and the new Assistant is completely comfortable in their role, we will be expanding even more, hiring new commercial agents to work in our NAI team. Plenty of excitement, and hopefully it will be a successful, exciting year for you too! We hope you are back into the swing of things at work, and didn't find it too much of a struggle to get out of 'holiday mode'. Last Friday the 7th of November was the night our office had been preparing for, for quite along time! Together with Conveyancing Home, NAI Harcourts Pinnacle and Harcourts Pinnacle held a charity gala for Zoe's Angels. The night went off with a bang, starting with Brazilian dancers, followed by multiple acoustic performances by Nick Trovas, a ukulele performance by Olympic Gold Medalist Matt Mitcham, raffle drawing, lucky door prize drawing, charity auction, and speeches from the Zoe Angels team, as well as some Arthritis sufferers and pediatric rheumatologist, Dr Navid Adib. Between these events the drinks were flowing, we enjoyed a three course meal, and after the event the DJ started the after party. In total, we raised $35,100 - a huge achievement! We'd like to extend a huge thank you to everyone involved, and who attended and donated! Click here to see all the photos from the night, and a thank you message from our office Principal, Johnny Lin. Welcome to our new website, just part of our growing social network presence to keep up with the internal growth we are currently experiencing. NAI Harcourts Pinnacle has achieved great success within a very short period of time since opening. We have developed an impressive portfolio of listings that can be viewed under the 'Search Property' page. Recently, we brought on a Personal Assistant, and are looking forward to hiring 5 new agents in the next 12 months. As an office, the Pinnacle team recently bought a conveyancing firm, and our finance, rental and residential divisions are going form strength to strength. Our director, Phil Grant, will be updating this blog page when the need arises. We aim for quality over quantity, bringing you only useful and relevant posts that will include current market updates, Commercial Property news, NAI Harcourts Pinnacle updates, tips and tricks etc. To kick it off, we'd like to tell you about a charity we are currently actively supporting called Zoe's Angels. Zoe’s Angels brings awareness to children suffering a chronic debilitating rare illness. Juvenile Idiopathic Arthritis is an incurable, painful and often debilitating disease. There are different subforms of Juvenile Arthritis, ranging in severity. Zoe is currently undergoing treatment in France (Her father's homeland) and fortunately, her family is able to fund most of these costs. However, many families struggling with JIA cannot afford treatment, and as it is such a rare disease there is very little funding or charities available to help. Zoe's Angels' aim is to raise money to help these families pay for their treatment. They also sponsor children to go to a camp in NSW where they can meet others with JIA, have fun, make friends and feel less alone. Our office is holding a Charity Gala on November 7th and Gambaros Restaurant on Caxton Street. There are less than 5 seats left, so get in quick to secure your spot, and if you can't make it, be sure to check back for our post-gala blog entry. More information on the gala can be found here.